This is a really extensive package of features. 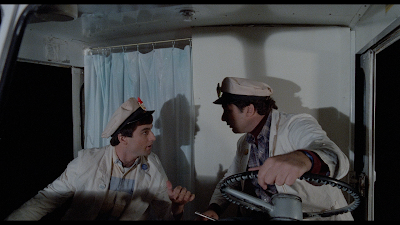 The best features being the Ballyhoo-made featurette about the Chiodo Brothers’ childhood films. 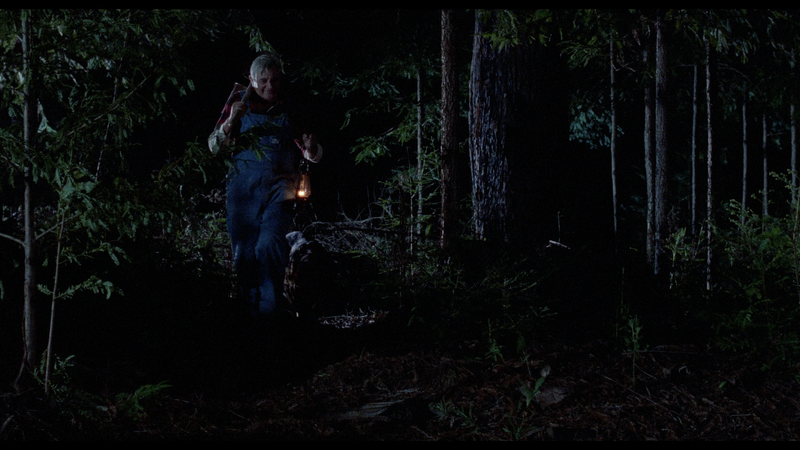 I was wrapped up in this look back at their own films, that I wanted it to keep going. Having the films on the disc as well was a nice touch. The other special features are interesting in their own right, but I don’t think that I would go back to them. I would go back to the Ballyhoo doc, however. 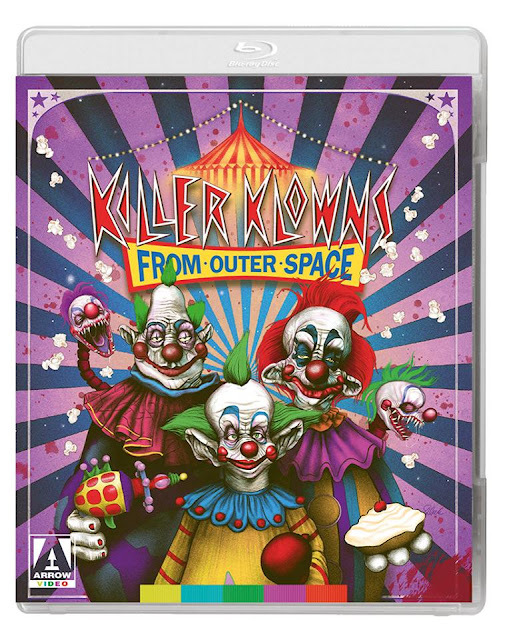 Fans will love these features as this disc has pulled together everything that has been made about the film into one package. I was sent this blu-ray as a screener and can not review the packaging at this time. When I am able to, I will show off the packaging. Arrow has remastered the film in 4K and the results are incredible. Colors are vibrant, skin tones are accurate, and grain is intact. 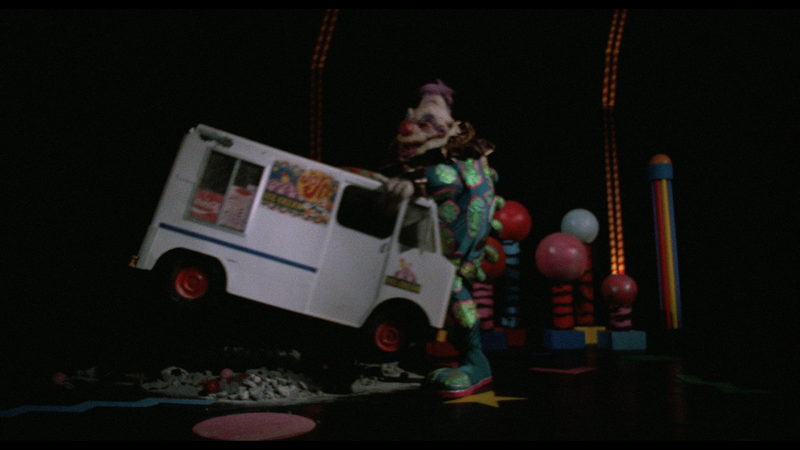 The transfer captures the feel of the film like no other transfer before and brings Killer Klowns into a new light. Arrow has given us an LPCM 2.0 track as the main soundtrack and it is really good. 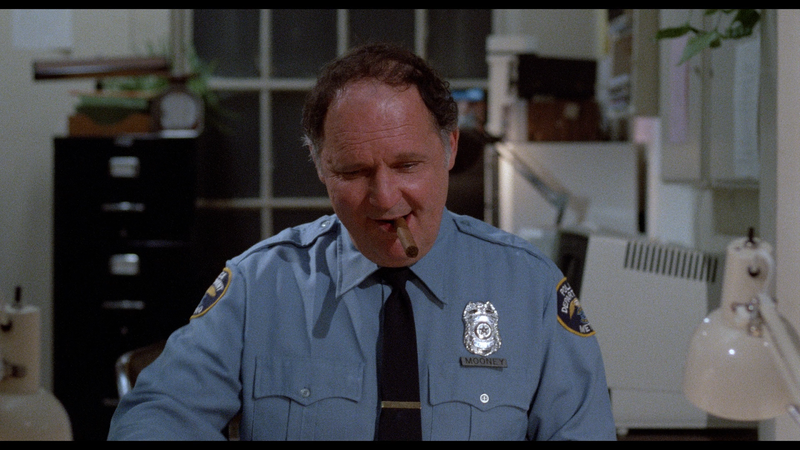 Everything comes through loud and clear and the score, by John Massari, sounds great. When Mike and his girlfriend Debbie warn the local police that a gang of homicidal alien-clowns have landed in the nearby area (in a spaceship shaped like a circus big-top, no less), the cops are naturally sceptical. Before long however, reports are coming in from other anxious residents detailing similar run-ins with the large-shoed assailants. 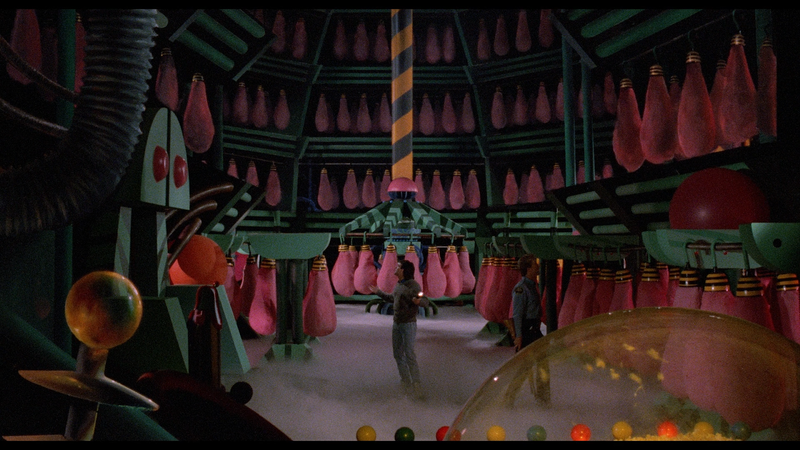 There can no longer be any doubt – the Killer Klowns from Outer Space are here, and they’re out to turn the Earth’s population into candy floss! Killer Klowns from Outer Space was not a mainstay in my household when I was growing up. 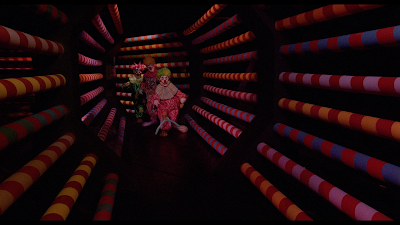 I had seen the film as a child a few times, but it wasn’t one of my favorite films. I recognized the imagination that the film has on display, but I hated the characters. 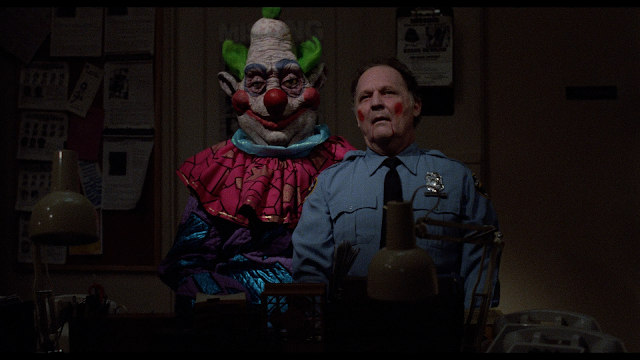 The characters are very one-note and so poorly written that I started to root for the Klowns. So I don’t have the attachment to the film that many out there do. 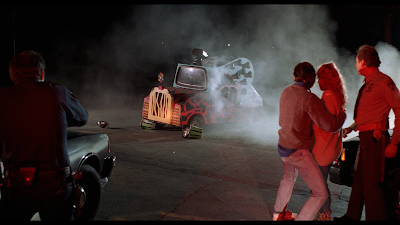 As I mentioned before, the film has a ton of imagination and does a lot with what had to be a very small budget. The balloon dog, the popcorn gun, and the shadow puppet are among my favorite things from the film. 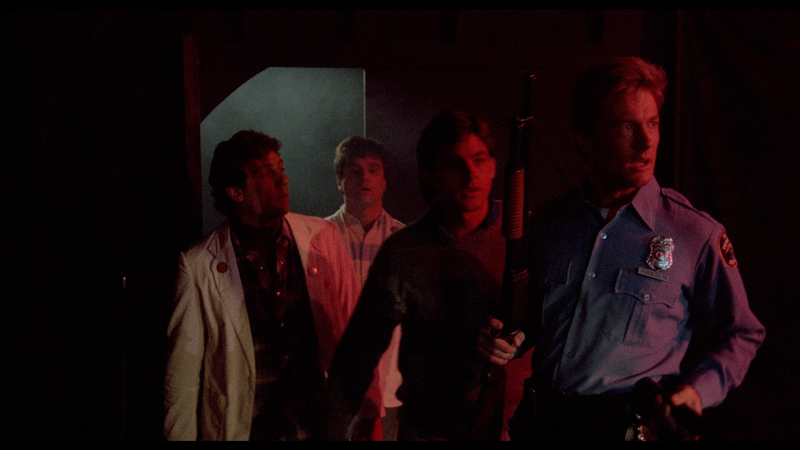 All of these effects are pulled off brilliantly by the Chiodo Brothers and their crew. 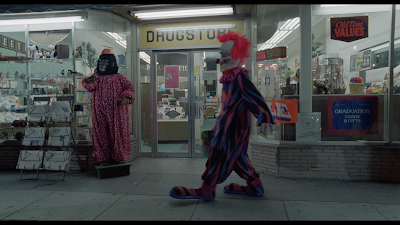 Nothing here looks fake, we buy everything that happens in the film because the Klowns and their tricks and gear are so real throughout and put together. 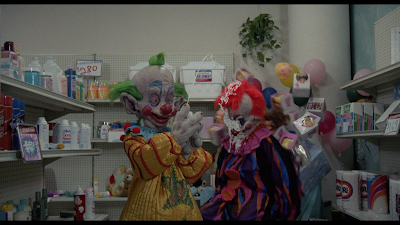 The film also has a certain charm to it, but only when the Klowns are onscreen. 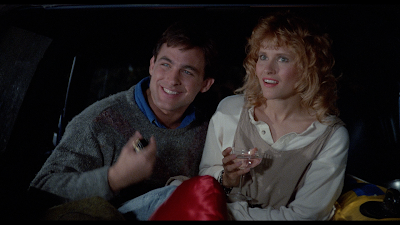 There is an innocence and level of fun that the film tries to instill in us as we watch. 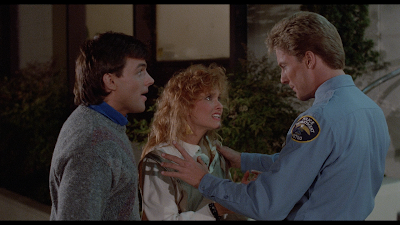 Whenever the human characters are the focus, the film loses much of the charm because the characters add nothing to the story other than as an avatar for the audience. Trust me though, as a kid, rooting for the Klowns was the order of the day. We didn’t care about these characters. We just wanted to see the Klowns and what they had in store for us next. There was one human character that I liked and that was Mooney, played by John Vernon. 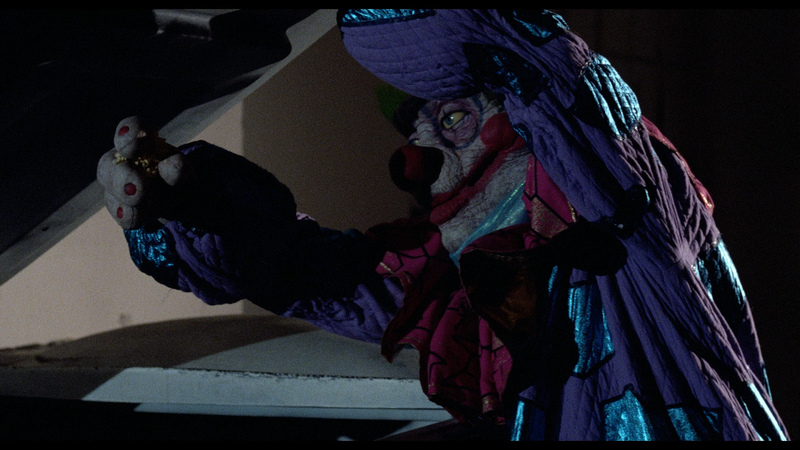 There is a creepy scene where one of the Klowns sits Vernon on his lap and uses him as a marionette puppet. When the Klown is done using Vernon to threaten the other characters, he removes his hand from his back (the hand being covered in Vernon’s blood) and throws Vernon down to the ground. This scene always stuck with me. 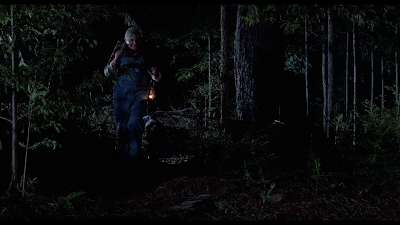 I do wish that the Chiodo’s had done more with this scene, but it is very effective and one of the only scenes in the film that is creepy. 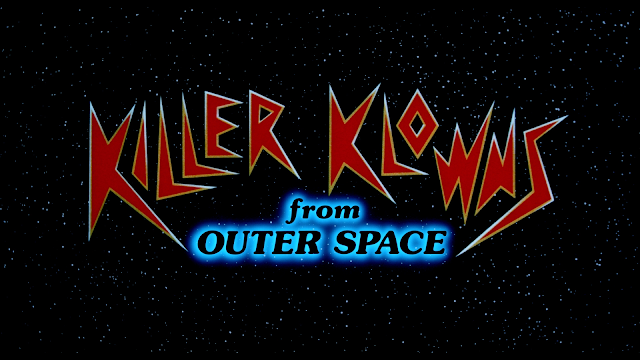 Killer Klowns from Outer Space is a good film that has a lot of flaws. Had the Chiodo Brothers written more fleshed out characters I think I would have had a better time watching the film. I do think that the film is imaginative and looks great, but we don’t connect to anything that is happening on screen. 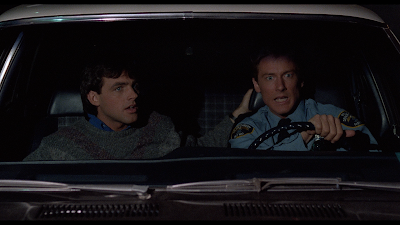 The film plays out like a series of skits that end as soon as the gag becomes useless. 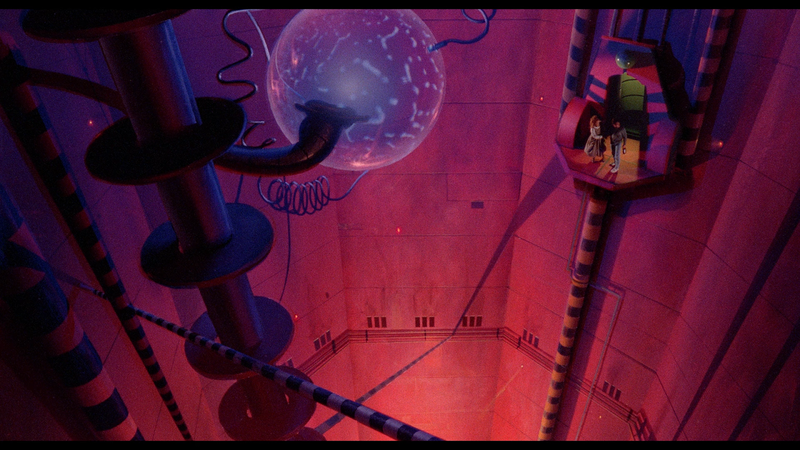 Had the imagination been put into a better story, I think that the film would be more of a cult classic than it is. 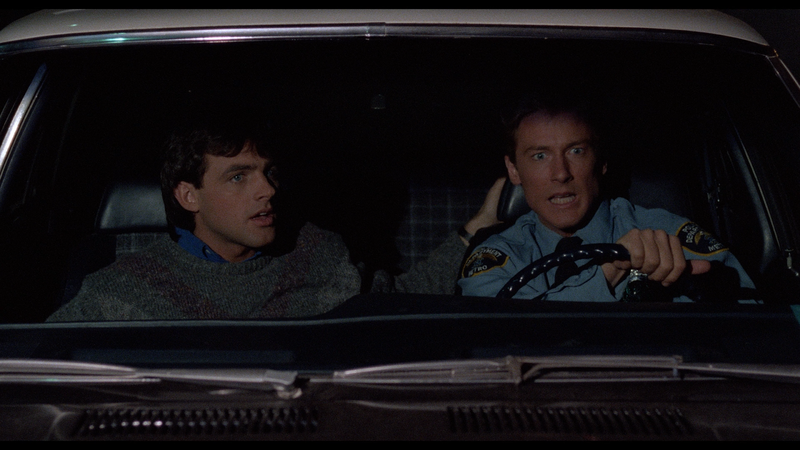 The blu-ray, from Arrow Video, is excellent. The video and sound quality are amazing and the special features are numerous and thorough. 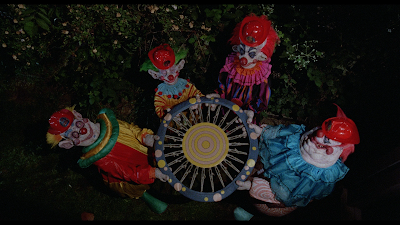 The biggest thing for me was the featurette focusing on the Chiodo Brothers’ super 8 films that they made when they were kids. 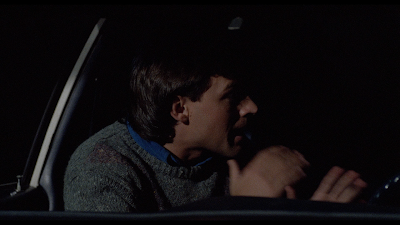 Those films show that, even at a young age, the brothers knew what they wanted and learned everything that they could to get that vision on the screen. I would recommend this disc for fans of the film and those who want to a thing or two about making movies. You won’t get everything here, but you will get enough to get you going. MORE SCREENSHOTS!! SCREENSHOTS MAY CONTAIN SPOILERS! !